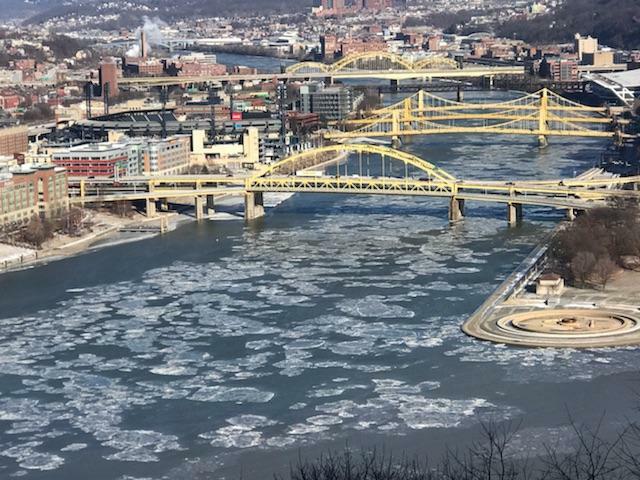 The Confluence of the Allegheny and Monongahela rivers during polar vortex temperatures on Thursday, Jan. 31, 2019. The Monongahela River has no ice floes, whereas the Allegheny is dotted with them. They both flow through Pittsburgh, slicing the city into distinct neighborhoods, they’re both covered in bridges, and they both move commerce through the region. As temperatures reach new lows this week, Good Question! listener Mark Brandfass observed a difference between the two waterways from his office on the 22nd floor of a building on Stanwix Street. U.S. Geological Survey data on the daily temperatures of the Monongahela (left) and Allegheny (right) rivers at sites near Elizabeth and Acmetonia, Pa.
“I noticed that there were ice floes on the Allegheny, but none on the Mon,” Brandfass said. Large accumulations of ice have, indeed, formed on the surface of the Allegheny River along Pittsburgh’s North Shore. But over on the South Shore, the Monongahela’s surface is its normal, watery self, free from ice. This story is part of our Good Question! series where we investigate what you've always wondered about Pittsburgh, its people and its culture. The quick answer, according to Clarion University professor of Biology and Geosciences Andy Turner, is that the rivers are different temperatures. The Monongahela tends to run a little warmer than the Allegheny because it’s flowing north from a watershed that’s located south of Pittsburgh. The Allegheny is chillier, Turner said, because it’s flowing south from a watershed located to the north. Good Question! listener Dan Stump says he's been noticing the difference between the ice on the two rivers since he was young. He guessed the Monongahela was a bit warmer because of the industrial activity on the river, like the Clairton Coke Works or manufacturing facilities in Braddock. The reverse of this is also true: in the warmer air temperature months of summer, the river water temperatures still run cold. Rivers are particularly interesting, Turner added, because warm water sinks to the bottom, bringing cold water to the top. That's why it's more common for lakes to freeze and for people to safetly ice skate on them, rather than rivers. Plus, the Allegheny flows slightly slower. Impoundments, or reservoirs formed by dams, can also contribute to different water temperatures. Rivers with more impoundments tend to be warmer. But in the case of the Allegheny and Monongahela, Turner said it's not really an issue, as the two have nearly the same number of lock and dams. Pollution doesn’t play a major role in ice formation either, Turner said, even though Braddock's Edgar Thompson Steel Works and the Clairton Coke Works operate near the Mon. The river does have a slightly higher salt content, however, which can be attributed to the minerals already in the water, as well as runoff from industrial facilities and road salt. “But it’s not enough to significantly affect the water freezing point,” he said. When the two rivers meet at the Point, their temperatures will start to average out over several miles as they converge to form the Ohio River. A Pittsburgh TV news producer who was fired for writing a graphic calling New England Patriots quarterback Tom Brady a "known cheater" says he was just trying to have a little fun. Michael Telek tweeted Wednesday that he got fired from KDKA-TV for putting the phrase underneath Brady's name in the Monday news segment.